The rise of digital media has been widely regarded as transforming the nature of our social experience in the twenty-first century. The speed with which new forms of connectivity and communication are being incorporated into our everyday lives often gives us little time to stop and consider the social implications of those practices. Nonetheless, it is critically important that we do so, and this sociological introduction to the field of digital technologies is intended to enable a deeper understanding of their prominent role in everyday life. The fundamental theoretical and ethical debates on the sociology of the digital media are presented in accessible summaries, ranging from economy and technology to criminology and sexuality. Key theoretical paradigms are explored through a broad range of contemporary social phenomena – from social networking and virtual lives to the rise of cybercrime and identity theft, from the utopian ideals of virtual democracy to the Orwellian nightmare of the surveillance society, from the free software movement to the implications of online shopping. 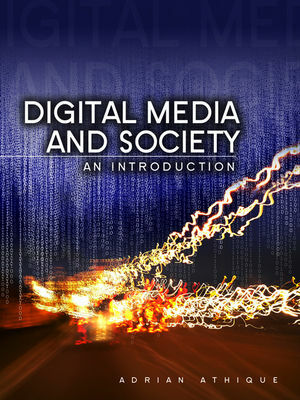 As an entry-level pathway for students in sociology, media, communications and cultural studies, the aim of this work is to situate the rise of digital media within the context of a complex and rapidly changing world. Adrian Athique is senior lecturer at the University of Waikato, New Zealand. "A concise and eclectic yet satisfactorily rich and well contextualized account of digital life."